Experts who are paving the way on tackling antibiotic resistance (AMR) will gather when SMi’s next annual Superbugs & Superdrugs USA conference arrives to Iselin, New Jersey in just 4 weeks’ time. Building on over 20 years of success in Europe, the USA event has attracted a truly global audience from Canada, Denmark, France, USA and UK. New pathways to facilitate research from bench to bedside with a detailed spotlight on the latest government incentives and funding opportunities. Will include a keynote address from John Rex (AstraZeneca). Strategies to address the problem of MDR Gram-negative pathogens through key updates on three new discovery projects. An agenda tailored towards strengthening the antibiotic pipeline with 15+ hours of content on innovations and clinical breakthroughs. International case studies on medical devices and hospital acquired infections, minimising the microbiome’s disruption, immunotherapeutics and innate defense regulators. A look into the link between animal models and humans to improve clinical outcomes. 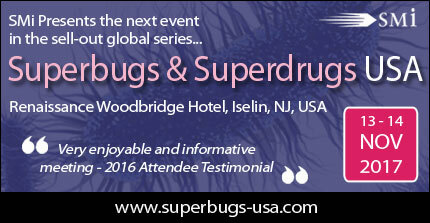 Superbugs & Superdrugs USA will take place on 13th & 14th November at the Renaissance Woodbrigde Hotel in Iselin, New Jersey. Sponsored by Merck and Soligenix.